In Matt McFetridge's words, his two-and-half year stint in China was the "time of his life". The American student, a native of the Finger Lakes region, New York, became fascinated by the ancient country after meeting his first Chinese friend Andi, a classmate in his undergraduate class. 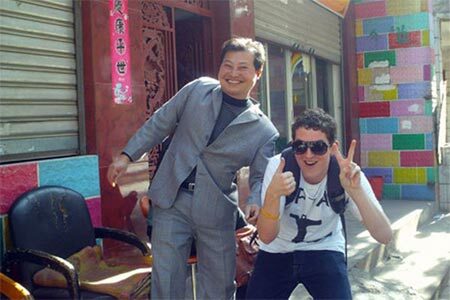 In the fall of 2010, McFetridge arrived in China to study abroad for the first time. In the picturesque southwestern city of Kunming, his Chinese friend's hometown, he had an "amazing and warm experience," and he realized the six-month program "was simply not enough". When he returned to the United States, he began applying for graduate programs and in 2012 began a two-year master's course in international relations at Tsinghua, one of China's most prestigious universities. "Coming to China was the best decision I have made," he said. McFetridge is one of American students who have studied in China since the two countries began an educational exchange program 36 years ago. China has since seen a steady flow of American students, increasing from 8,480 in 2004 to 24,203 in 2014, according to China's Ministry of Education. They became the second biggest group of international students in 2008, with South Korea the largest. As McFetridge was enjoying the sunshine of Kunming, his fellow countryman Eric Schafer moved to Beijing from California two years after getting a bachelor's degree in political science from Berkeley. Unlike McFetridge, whose connection with China began with a friendship, the Berkeley graduate chose Beijing because he saw "the substantial influence China had on the world", even though he could barely speak Chinese back then. "I couldn't shop at the store, I couldn't go to the bank, I couldn't order food -- I couldn't do anything!" Schafer said, recalling the beginning of his journey in China. The frustration brought by the language barrier did not last long as he began a three-year intensive Chinese-language program at the Beijing Language and Culture University. Looking back, Schafer, who just recently completed his master's degree in international relations and is now a faculty member at the Peking University, said, "I have no regrets at all. My life in China has been fulfilling, and I'm very happy to be here." "At times, living in China can be challenging, but living here has been very beneficial and the challenges have made me a better and stronger person." The more time a person spends in a foreign country, the more they understand it. After spending years in China, McFetridge's impression of China had changed, "but mostly positively." "The country has some obvious room for improvement in certain sectors, but that being said I applaud the development the country has made in such a short amount of time." For Elyse Ribbons, studying Peking Opera at the National Academy of Chinese Theater Arts, her view on China has changed a lot since she came to Beijing in 2001. "China only meant three things to me when I first arrived: the Great Wall, Pandas and Kung Pao Chicken, but now I am an old hand, I am often invited to introduce Chinese culture to native children," said Ribbons, a radio host, playwright and entrepreneur who is known in China by the name Liu Suying. Life in China also helps American students understand that Chinese and Americans "have a lot of common ground." Schafer said that many people living abroad compare "my people to their people", but he tries to think of people as "people" not "Chinese" or "American." "I think in this way I can be more objective and better understand the world around me," he explained. Culture in fact is superficial, as different cultures have different manifestations, said Frank Hawke, one of the first eight American students to study in China in February 1979. After spending more than three decades in China, Hawke, now the China director for the Stanford Graduate School of Business, said he always suggests that students who study in China should not focus on the superficial differences between Chinese and Americans. "Chinese and Americans may eat differently, speak differently, deal with things in different ways [...] but why is that? In the process of answering that question, you will find that they are fundamentally the same," said Hawke. People-to-people exchanges, of which student exchanges are a large part, are a crucial tool for country relations. "Students who have studied in each other's countries are the best envoys between China and the United States," said Ruan Zongze, a senior expert on China-U.S. relations. They know both the different countries and they understand both cultures so play a unique role helping eradicate differences, said Ruan, vice president of the China Institute of International Studies. According to the 2014 Open Doors Report by the Institute of International Education, China remains the fifth largest host destination for American students following Britain, Italy, Spain and France. The increase in students shows China's international influence and market potential is recognized by the United States, said Wang Huiyao, president of the Center for China and Globalization. "Both governments and the public attach importance to more U.S. students choosing to study in China," Wang said. Helping the numbers are two of the largest exchange programs ever created between two governments. Part of the China-U.S. high-level consultation on people-to-people exchange (CPE) created in May 2010, China's "Three Ten-Thousands" project will see 10,000 Chinese students sponsored to study in the U.S. for doctoral degrees, 10,000 U.S. students will be admitted to study in China and another 10,000 U.S. students will be given scholarships. The American "100,000 Strong" initiative, led by the U.S. State Department, aims to send 100,000 students to study in China, which it achieved last year. China and the U.S. have formed a stronger link through their students. The number of Chinese students in U.S. colleges grew by 17 percent during the last full school year, hitting a record-breaking 274,000. While McFetridge said he would like to move to China permanently, he has to leave after graduation due to visa regulations. For many students, finding work in China immediately after graduation is tough, but this may soon change as China is exploring ways to address internship and employment restrictions. "To attract more foreign students to China, it is important to help foreign students make their career plans and provide them employment guidance," the Ministry of Education told Xinhua. McFetridge, now a master's candidate in the University of London, said he will definitely come back once the new policies are adopted, "because China suits me."